Advantec Internet Services needed to upgrade their office environment and create a new meeting room for driving their internet services business and contacted Hampshire Mezzanine Floors for initial advice. Hampshire Mezzanine surveyed their existing premises and proposed to form a new meeting room within the open plan of this environment to be constructed out of full height fully glazed partitioning which formed a new meeting room without losing any natural light from the existing windows, which was a key requirement for Advantec Internet Services. 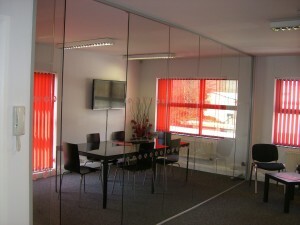 HMF also removed existing stud partitioning and made good the existing surfaces where these were removed. 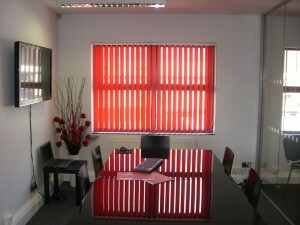 The whole new office area was also re-carpeted over a weekend to minimise disruption to the business. As a finishing touch, Hampshire Mezzanine Floors replaced all the window blinds to the building and colour matched them with the client’s new office furniture. This office fit out has greatly enhanced Advantec’s working environment, improving not only their staff’s working conditions but also for all their visiting clients when using the new meeting room. 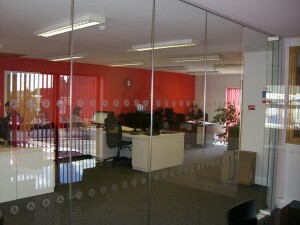 “HMF carried out a full office refurbishment for us, which involved installing new, modern glass partitions and carpets. I was extremely pleased with how the project went – everything was completed exactly to their planned schedule with minimum disruption to our business. Advantec Internet Services are currently in the process of designing HMF’s new website which is due to be launched in the near future and they also provide SEO services for Hampshire’s leading fit out company, Hampshire Mezzanine Floors.